September 30, 2011: When I followed some horses clippity-clopping down the rue de Rivoli, I had no idea that they were the French Republican Guard. September 27, 2012: I was waiting to take photos of the procession from a prime location on the rue de Castigilione. 2011: After following the French Republican Guard to the Place Vendome, I was surprised to see all of the sleek vintage cars that were participating in the 45th annual Paris-Deauville Rally. 2012: I'll be riding in a Delage automobile in the rally and posting updates from the road on facebook and twitter. 2011: I mistook Ciara for Beyonce and didn't recognize any of the fashionistas. 2012: I still don't know who's who but I've learned to look for signs, like fans holding CDs for the stars to autograph, so that I can google them as soon as I get home! American singer Lana Del Rey, who released her first album, "Born to Die" in January 2012, at the Westin Hotel in Paris. 2011: I didn't recognize Guillaume Hoarau (bottom left), a professional soccer player for Paris Saint-Germain. 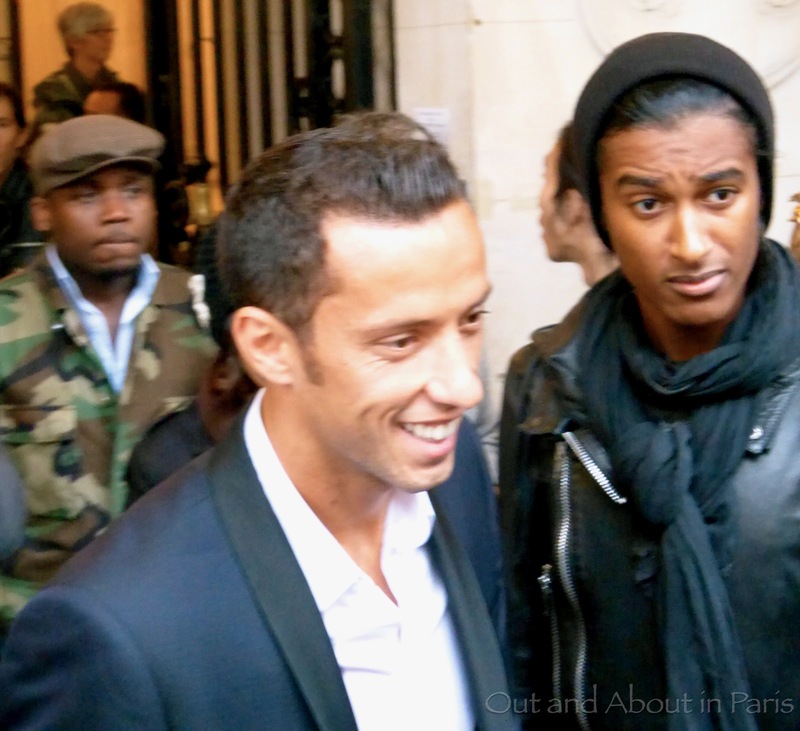 2012: I noticed that Guillaume Hoarau's friend (dressed in black) was with a different PSG soccer player whose name I don't know. Some things never change! Please click here to see last year's post on horses, cars and beautiful people. Photo from 2011 (left) and 2012 (right). Gorgeous photo of the Republican Guard!!! Thanks, Anne! I was really pleased to get that photo because last year I only managed to get pics of the horses' haunches and the Republican Guards' backs as I chased them down the street. Look at all of those fancy shmancy people!! Oh my gosh! I just got a chance to listen to Lana Del Rey. Of course, I know her. I love her song "Video Games"! Now I regret not asking her for an autograph. She was really nice with all of her fans and posed for photos with them, etc. If you saw my tweets from the rally yesterday -- I'm sorry! I mistakenly posted some of the updates a couple of times because I didn't know that they had already gone through because of the poor reception en route. Anyway, I rode in one of the cars in the rally to Deauville. I'll write more about it as soon as I've recovered from all of the excitement. now I know what you mean by "ducky". I just watched a video of her on YouTube and the difference in her lips is striking. She looks so much better now! Amazing shot of the sleek car Mary Kay! What I particularly like is that the umbrella matches the car's colour scheme. Which do you suppose came first, the umbrella or the car?! Since I didn't know much about vintage cars before the rally, I only found out yesterday that the car is a French Delage. Love the first photo of the Guard, so stately. Did you notice the red umbrella bears the name of Laurent Perrier--the champagne I took to Jane's party. I keep good company, obviously. You mean the MAGNUM of champagne that you took to Jane's party? Yes, I did notice it was the same as the name on the umbrella and naturally thought of you! Are you friends with Jane on facebook? Sylvia showed me the photos from the party that are posted online. Of course, you and your champagne feature in many of them! Hooray, handsome guard time again ...!